Finally getting to meet Svengoolie! It’s been awhile since I have had fun…I mean fun like a kid. As adults we become pre-occupied with things such as working, paying bills, raising a family, etc. Not that these are bad things but in the process, we forget how to have fun like we did when we were kids. I think that is why I like being a monster fan so much…you can do all of the important and responsible things in life and yet still be a kid! Who can forget the excitement as a child on Christmas Eve. Family get-togethers that then led to a sleepless night, in anticipation of Santa’s annual visit. This followed by the nervous excitement of walking down the stairs to see if the big guy brought us everything that we had asked for. These times were magical and that is the first thing to go in adults…the magic. 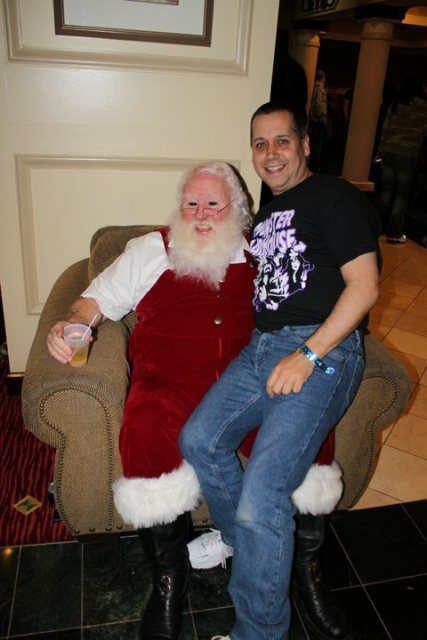 Dear evil Santa…I wanna meet Svengoolie! Thankfully for me, I was able to recapture that magic just recently. The plan was to visit my best friend Dave (yes, the other Dave in TERROR FROM BEYOND THE DAVES) to go to HorrorHound Weekend in Indianapolis, IN on the weekend of March 25th thru the 27th, 2011. I was to fly in on Thursday morning, the 24th, and then visit the Brookfield Zoo where Dave is a docent, getting a personal tour. As the date grew closer though the stars aligned just right and the magic began as the horror host that brought me and Dave together as friends, Svengoolie, would be making an appearance that evening at the zoo! 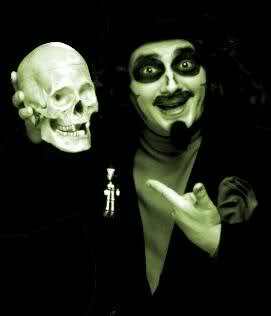 Though I was always aware of horror hosts, Svengoolie was the first host I actually experienced. In the early 80’s his Son Of Svengoolie show was syndicated in Boston, MA on WLVI Channel 56. Our weekly monster movie show, The Creature Double Feature, was trying to do something different by adding a host. Though he was based in Chicago, part of his syndication deal was to record short bits about the area he was being shown in, personalizing the experience. I loved Sven’s antics and song parodies. In fact, I remember using a hand-held tape recorder and holding it up to the television’s speaker to record these songs (I wonder what ever happened to those tapes?). It was soon after that I was out searching local hobby shops for a human skull model kit so that I could build my own Zallman T. Tombstone, one of Sven’s sidekicks. One shop finally had to special order one for me but I did get my own Zallman, even though I never seemed to be able to get the moustache right. It was also thanks to Sven that I got introduced to a little horror magazine called FANGORIA (you may of heard of it). They ran an article on the Son Of Svengoolie, so of course I had to run right out and get it and quickly became hooked on this magazine. 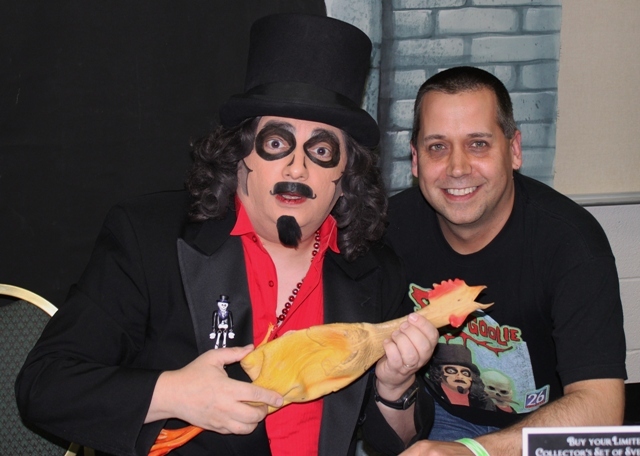 The fact that I would finally be meeting Svengoolie, after all these years, just added a whole new level of excitement to my trip to the windy city. But I am getting ahead of myself. I have never been afraid of flying…in fact I enjoy it very much. I was a little nervous this time though because it was the first time I would be flying by myself. I am definitely one of those people who over thinks things initially, causing myself to get nervous, usually about nothing. Getting through security was a breeze though and it wasn’t long before I was in the air. Because I had to get up at 4 am, and because I knew I had a long weekend ahead of me, I just sat back and relaxed. The flight arrived on time, which was amazing to me since when I left Rhode Island it was snowing very hard and the plane had to be de-iced before taking off. Even finding myself around Midway Airport was easy and it wasn’t long before I had my luggage and was waiting for Dave to pick me up curbside. Dave greeted me with a welcomed hug and then we were on our way…first stop his house to drop off my luggage. Thanks to my early flight (I arrived in Chicago shortly after 8:30 AM) we had a full day ahead of us. 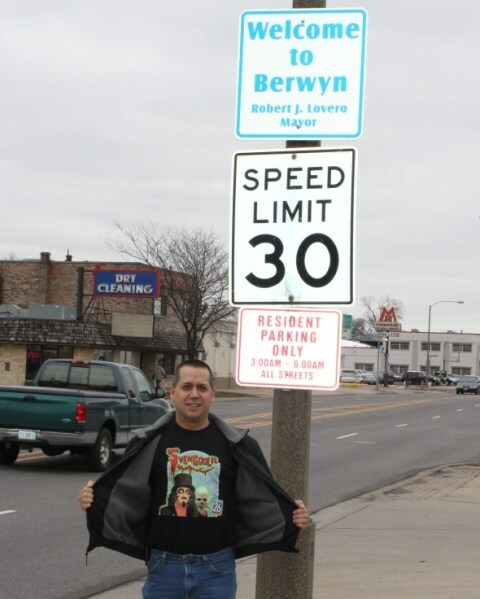 The first stop of the “Svengoolie Tour” was Berwyn, made famous by Sven’s constant ribbing of the city. But first we needed to get something to eat. So many choices but in the end the choice was clear…White Castle. There were really two reasons for this…first off, Rhode Island doesn’t have them and second, White Castle was recently the site of a “Dinner With Svengoolie” contest (read all about it here). 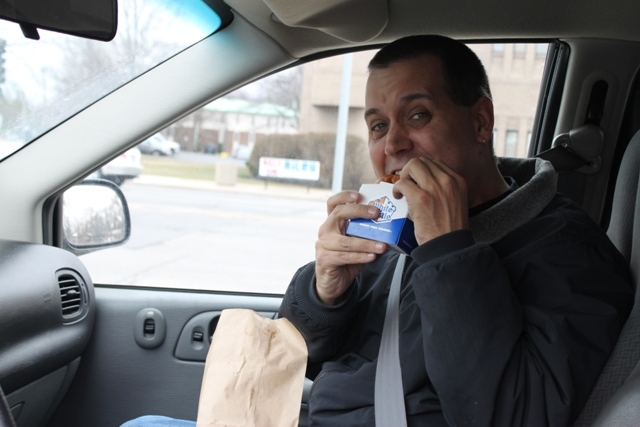 Since Dave wasn’t sure if I would like White Castle we decided to sample them by going through the drive-thru. I did end up enjoying them so we went inside for some sliders, fries and soda. The next leg of the tour took us to one of the coolest stores I have ever been to (and who also provides the rubber chickens thrown so much at Sven on his show). The store? Horrorbles! 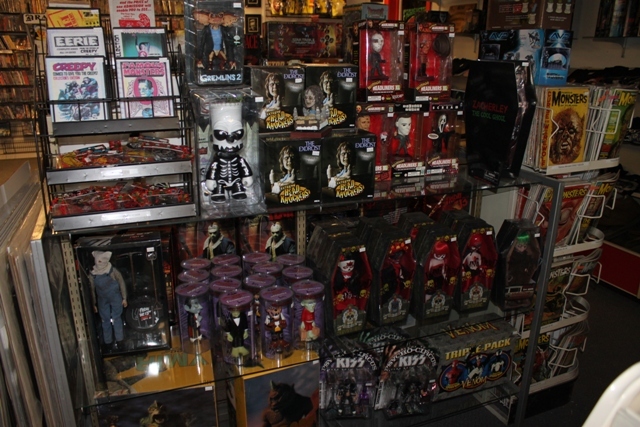 If you are a fan of horror/sci-fi/monsters then Horrorbles is the store for you! This place is packed solid, front to back, ceiling to floor and even in the basement with every kind of toy, model kit, mask, t-shirt, figure and magazine you can imagine (and that is just in the first 10 feet of the store). Being a fan of this type of collectible, it took every ounce of energy to leave with just a t-shirt! 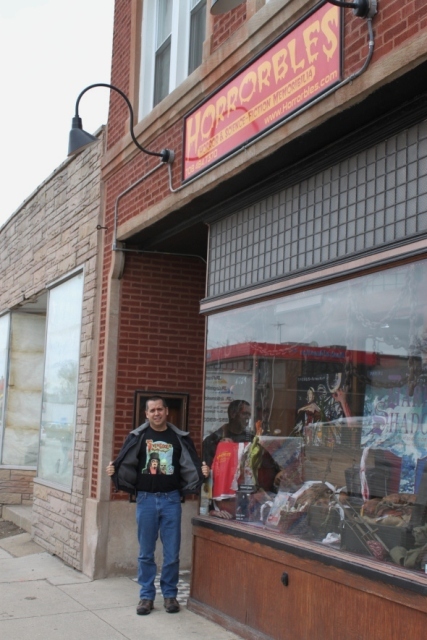 The owner, John Aranza, has amassed quite the assortment in this store creating a collector’s dream! I am probably lucky that we don’t have a store like this in Rhode Island! John is an unassuming man with a smile on his face for this labor of love. There are so many treasures in this store that it is almost overwhelming, not knowing where to look first. To take it a step further, in the basement is a miniature movie theater, complete with popcorn machine, that you can rent out to watch your favorite horror films, past or present. I know this is one store I plan on visiting again each time I go back to Chicago! The next stop of the tour was the Brookfield Zoo. Sure this may not seem like a place to include on a Svengoolie tour but Sven has had an ongoing relationship with the Brookfield Zoo, especially when it comes to fundraisers. Personally I wanted to see the zoo itself since I am also a docent at the Roger Williams Park & Zoo in Rhode Island but what better way to end the day then with meeting Sven? 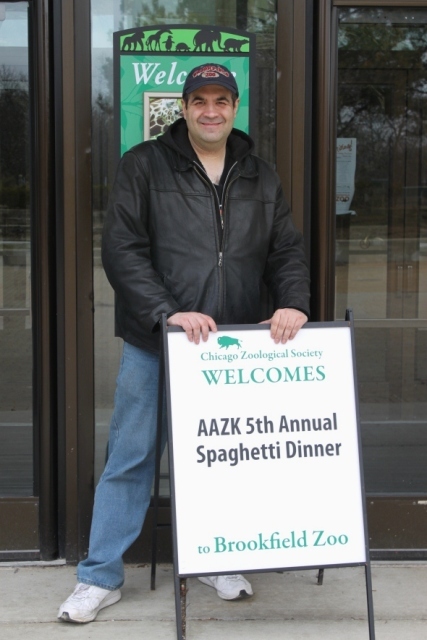 After a thoroughly enjoyable day checking out all that the zoo had to offer thanks to my personal tour guide, Dave Fuentes, it was time for the AAZK (American Association of Zoo Keepers) spaghetti dinner fundraiser for Vital Ground, an organization that seeks to obtain land for the protection of grizzlies and other animals isolated due to human encroachment. The food was surprisingly good, which doesn’t always happen at events like this (but then again, how can you mess up spaghetti?). As 5 PM drew closer the excitement within grew. Because of appearances Sven has made in the past Dave knew exactly where he would be to meet his fans. We stood outside the door patiently for the big moment. A gentleman who was obviously in charge of this part of the event was kind enough to keep us posted as Sven was running a little late. This was fine though because finally meeting Sven was so worth the wait. Then the moment was upon us. The gentleman in charge said that Sven was there and that a bunch of people had snuck in to meet him and that he was taking us in to the front of the line because we had waited so patiently where we were supposed to. Thanks to talking with Svengoolie on Facebook, and because of us covering him many times on the TERROR FROM BEYOND THE DAVES site, Rich and his friend Jim Roche immediately knew who we were (plus Dave had already had the honor of meeting them previously). The smile of Sven’s face when we entered the room was warm and genuine and it certainly made my weekend. Sven was fully aware of my history and love of the show and was so genuinely appreciative of me coming all the way from Rhode Island and finally getting to meet him. 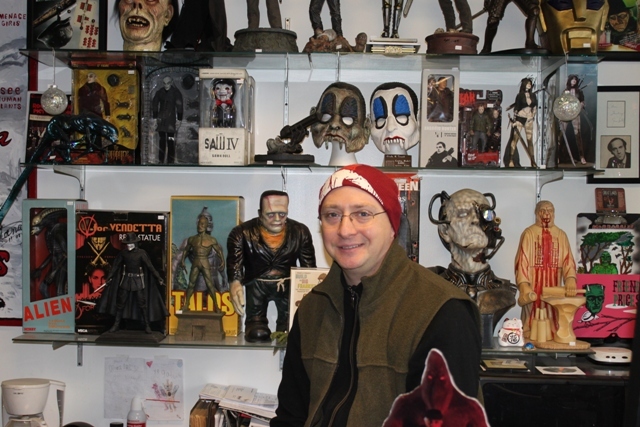 Sven is the epitome of a horror host…a class act all the way who genuinely loves his fans and isn’t afraid to show it. Dave and I presented Rich and Jim with official TERROR FROM BEYOND THE DAVES t-shirts and a copy of this year’s SCARY MONSTERS MONSTER MEMORIES issue, that included my monster memories of originally watching Sven. We talked with both of them for a while, laughing the whole time. We also took pictures, not only of just me with Sven and of just Dave with Sven, but also of both Daves with Sven. 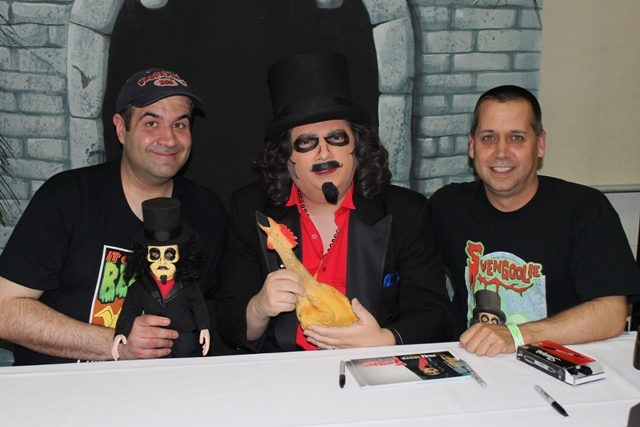 Dave had brought with him a Svengoolie doll created by artist Terry Cruikshank that he wanted Sven to autograph, which added some comedy to the meeting since Sven commented on how creepy the doll looked, especially with the eyes. I would’ve loved to have been able to spend more time with Rich and Jim but the line of people to meet Sven was getting longer. I do know though that I will see them again and it is something I am very much looking forward to. With Svengoolie going national I am hoping that it is only a matter of time before ME-TV is in the Rhode Island area and I can watch Svengoolie again, like I did 30 years ago. Of course this time I won’t have to rely on a roof antenna drawing in a weak and snowy UHF station! This entry was posted in Horror Hosts, Stalking Svengoolie! and tagged Berwyn, BROOKFIELD ZOO, HORRORBLES, JIM ROCHE, SCARY MONSTERS MAGAZINE, Svengoolie, Vital Grounds, White Castle. Bookmark the permalink. 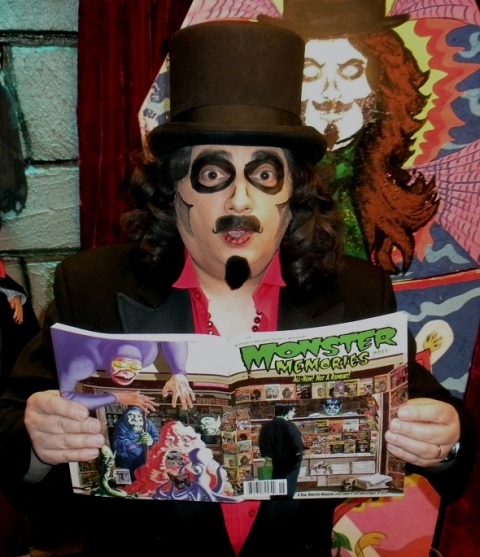 ← Svengoolie gives nod to Terror Daves in his Blog!